The trick to cutting a mango is working around the large, flat seed that runs down the middle. It's nearly the same size as the fruit itself, and most of the fruit flesh is in the domed "cheeks" on either side of this seed. The best approach is to cut off the cheeks and then trim any remaining fruit flesh from the seed itself. Choose heavy mangoes that give slightly when you press the area around the stem. Skin color varies by variety and isn't necessarily an indicator of ripeness, but look for mangos that have smooth skin with no blemishes. If the mango is still hard, let it ripen for a few days on the counter before eating. Cut off the mango "cheeks" - Hold the mango upright on the counter with your fingertips. Position your chef knife to one side of the center stem and slice straight down, hugging the flat of the seed as closely as possible. If you hit the edge of the seed as soon as you start to cut, remove your knife and rotate the mango 90-degrees. Turn the mango and slice off the other "cheek." You will have two big pieces of mango and the flat seed. Dice the mango - Hold one of the mango pieces in the palm of your hand or upright on the cutting board. 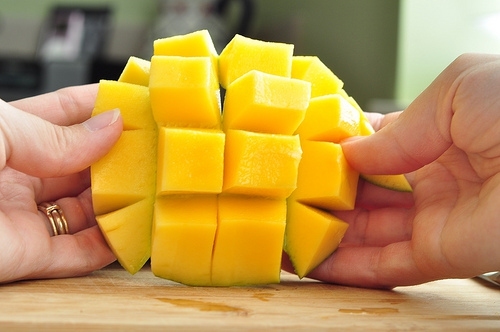 Using your paring knife, make long cuts down the length of the mango without slicing through the skin. Repeat with perpendicular cuts to form cubes. Turn the mango inside out - Gently press the back of the mango to invert the fruit. Use your paring knife to gently pry or slice the cubes away from the skin and into the bowl. Repeat steps two and three with the other half of the mango. Trim fruit from the seed - With the seed flat on the cutting board, cut around the seed to remove any remaining mango flesh. Cube the fruit without cutting through the skin and then pry or slice the cubes away from the skin. Sliced mango will keep refrigerated for several days or can be frozen for up to three months. Server responsed at: 04/25/2019 10:43 a.m.